Leema Xero review | What Hi-Fi? Pulled from the box, the Leemas are just as visually appealing as the first time we tested them. 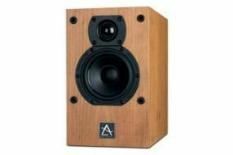 The real-wood veneer is smooth and expertly applied, and the fact that the two drivers occupy so little space (the tweeter is just 25mm and the mid/bass driver a mere 100mm) in what is already a very trim cabinet adds to their pocket-sized appeal. Around the back, there's a necessarily small reflex port and sufficient speaker binding posts to allow for biwiring. There's very little that's small-scale about the way the Xeros perform, though. No matter if the music is as complex as Rahsaan Roland Kirk's The Black and Crazy Blues or as spare as Four Tet's Ribbons, the Leemas attack it with determination and usually come out on top. They're endlessly revealing, dredging up fine details in a recording that lesser speakers simply ignore, and that level of insight makes for a vivid and vibrantly musical picture. Utterly faithful to source material, the Xeros are achingly expressive through the midrange, lending a real first-person immediacy to vocals and a weight of emotion that few rivals can come close to. Fast, precise and unquestionably controlled, the Leema's powers of resolution are quite startling at first. The integration between the two drivers is exemplary, and their faithful musicality encourages you to fritter hours away on long listening sessions. For such vanishingly small loudspeakers, the Xeros have admirable scale and dynamic heft – and the seamless integration between the two drivers means that even the weight of a complete orchestra in full attack stance can't wrong-foot them. Of course, we're obliged (and actually quite keen) to criticise where criticism is warranted, and these Leemas are not without foibles. They're emphatically not the most robust or fullest-sounding speakers in this test, and they're not about to fill your listening room with quaking bass. In fact, bolted on to an unsympathetic system, the Xeros can sound quite pallid in the low frequencies – even when backed right up to a wall to let that rear port do its thing. But we think that's solvable. Accept that these speakers can sound a little stark, and match your system accordingly – an extended session evaluating speaker cable should be able to put a little flesh on the (fast, precise, fluent) bones of the Xeros' bass reproduction. And once that's done, you'll have a teeny pair of speakers with a list of talents longer than a full-size floorstander.